THE WRITING BUDDHA - Opinions | Books | Movies: One Indian Girl by Chetan Bhagat (Book Review-3.75*/5) !!! 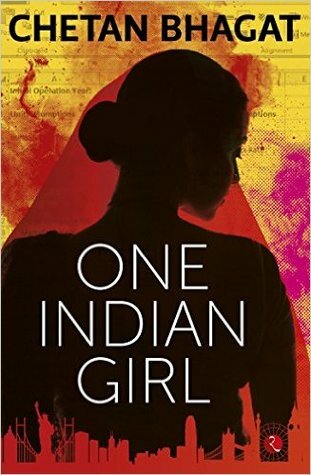 One Indian Girl by Chetan Bhagat (Book Review-3.75*/5) !!! CHETAN BHAGAT- A name that urged Indians to read more than a decade ago. I started reading novels after knowing about the humorous contents his books has. And after that I make sure that I read his books the first day after its release before someone else starts giving the review. Generally people believe in giving negative reviews to his book to prove themselves intellectual, literati or whatever! The last book that made me feel that it's the Chetan Bhagat I know was 2 States. Revolution 20-20 and Half Girlfriend couldn't impress me because I felt that I was reading a movie script than a fiction novel. This time he has come up with a book in female voice named "One Indian Girl". I was doubtful about this one too as I believed that it would be too feminist to digest. But fortunately, I am enough impressed with the story and felt that I read a book written by one of my favorite authors. The story is about a girl who is quite feminist and does not believe in getting pulled down by her parents or anyone just because she is a girl. She makes it sure that she does things which she feels is right without worrying about anyone else. She also have to hear about how she is doing things which are okay with boys but she shouldn't do it being a girl. But she is what not many girls in India are. She has a great job out of India. She earns what 10 average men cannot earn collectively in India. She has more than one relationship which is not digestible in Indian culture. And story of such courageous and successful Indian girl makes this book a phenomenal read. Chetan Bhagat have not tried to preach much feminism which is the plus point of the book. The story is very well handled right from the prologue. As is the case with many stories, even this one gets better when the story goes back in flashback. The characterization by CB is spot-on once again. The character of Radhika is very well crafted and the writing style of CB does not allow you to think that its not been written by a girl. Yes, I agree that few sentences are provocative as they are kind of general statements which not many girls would think while being intimate with someone or dressing themselves for a party. And I am pretty sure that CB-haters are going to pick up these sentences against him to pull this book down which has already broken Pre-ordering record on Amazon. The book has not been stretched anywhere. The second flashback is not as good as the first one and it has a reason because the affair is with a person of another class itself. The climax is little filmy but has an appropriate ending. I was little unsure about what decision will the girl take in the end but the feminist point is well handled in the end and the final decision of the girl only makes you smile in the end of the book. Talking about the drawbacks I would say that too much insight of the protagonist's job has been discussed which becomes irritating after a point of time. As I said above, at few places, CB has not justified a girl's point of view correctly which looks quite fake and attention-seeking. Also, the humour is again missing just like the last two books for which CB has become popular. Overall, I give this book 3.75* out of 5. It can surely be read once.